With Even More Advanced Oxy-Information! 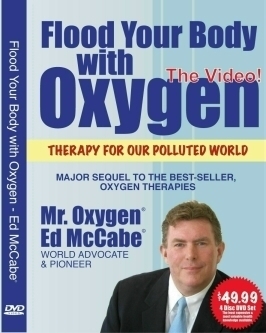 Ed McCabe's 1988 bestseller Oxygen Therapies, A New Way of Approaching Disease sold over 250,000 copies by word of mouth and without a major publisher! He has also appeared on over 2,000 TV, radio, and lecture platforms. The people want what he has to say! Now, after 22+ more years of intensive international researching, visiting clinics, lecturing to huge crowds, and interviewing thousands of successful oxy-therapy users, Mr. Oxygen , wrote it all down and taped it all for you and announces his brand new project, the best Oxygen Therapy book and DVD in history, The Flood Your Body with Oxygen.Series. Summary: The best place to find out how anaerobes cause all the anaerobic diseases! Ed McCabe©, Mr. Oxygen®, is an international natural detoxification expert. He has taught natural healing and natural healing information for 22+ years while strongly advocating the best natural healing options - Nature's powerful active oxygen and plant minerals. Natural health information was once hard to come by, but now Mr. McCabe has popularized and evevated natural oxygen healing, and natural mineral healing using oxygen and plant mineral supplements, to an international medical and naturopathic art. He teaches the most advanced natural therapy modalities incorporating detoxification and natural healing simply by focusing us on the best oxygen healing information available. His writings, books, lectures, videos, and DVDs are the absolute cream and cutting edge of all available health information.